Monarch butterflies are very common here in Hawaii year round. I often see them fluttering by my studio window. This giclee print is signed by the artist and is printed with archival inks on radiant white watercolor paper. It is a reproduction of an original acrylic painting and comes packed in a clear sleeve with a backing board (unframed). Colors may vary slightly from monitor to monitor. Thanks Marionette. Item arrived well packaged. Colors even more vibrant than my monitor showed. I have purchased several art prints by Marionette. I highly recommend purchasing her art if you are looking for unique and beautiful island inspired decor created by a lovely and gracious artist! 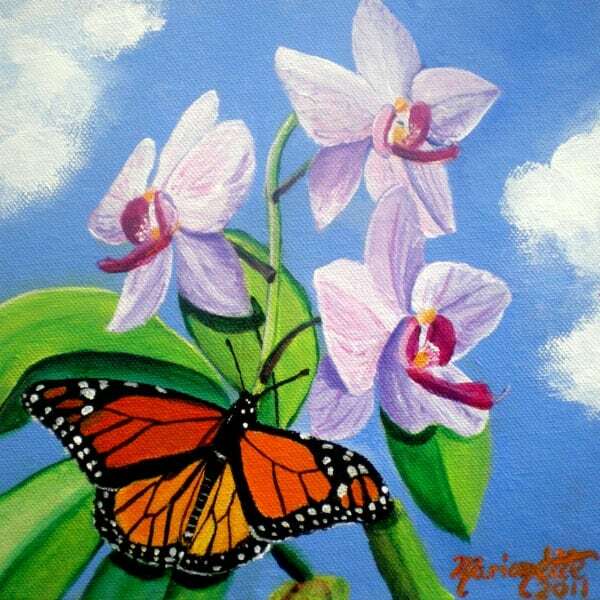 I love orchids and butterflies, and this print is beautiful!!! !